A few days ago, I posted a link to Teenage Vegan's blog. I've been waiting all week to try these strawberry crepes out for myself. I was most certainly not dissapointed. The only changes I made were the addition of a tablespoon of soy vanilla yogurt and a sprinkle of cinnamon on top of each crepe. I used the basic crepe batter recipe I posted a week or so ago. 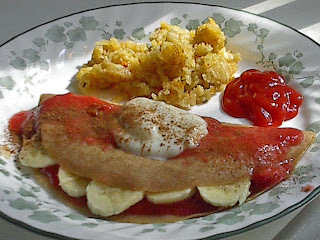 For the filling, I threw 6 large strawberries and 2 tbsp of agave nectar in a blender (made way too much for 2 crepes), and layered sliced bananas on top. Then, more strawberry sauce, soy yogurt, and cinnamon on top, and these light and yummy breakfast treats were ready for savoring! Note: I actually found agave nectar at Kroger (a large regional supermarket chain) in the natural foods section. So you might not have to find a specialty foods store to make these crepes. Thanks again to Teenage Vegan for the inspiration! oh my, those strawberry crepes look like pure bliss!